Determining the required gear ratio or maximum speed is not always intuitive. Many factors have to be taken into account. This page is particularly useful for electric or motor-driven locomotives. These calculations are applicable to models with mechanical transmission systems, either petrol engine powered or electric motor powered. Allowance is also made for up to 3 stages of gear reduction, often required due to space limitations. Note: Simple formulas using +-*/() may be entered if desired, not just straight plain numbers. If 2nd or 3rd stage reduction is not used, use 1 for both no-of-teeth inputs. Note: The number of teeth does not have to be exact whole numbers. If, for example, a 2.35:1 gearbox is used for one of the stages, use 1 as the driving input, and 2.35 for the No of teeth (driven) input. 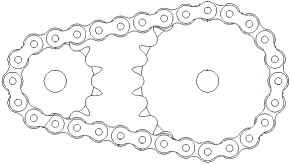 2nd stage reduction uses gears of 10T and 29T. 123 Text and photos Copyright © 2006-2019 SMEX, All rights reserved.